Dedan was a street beggar as a child and teenager. But a car ran him over when he was still a young child begging in the streets and his right leg had to be amputated. Dedan then had to learn to survive in the streets with only one leg. I first met him in 1994 when he was 14 years old. I talked with Dedan and his friends every time I passed them at the Kenyatta Avenue roundabout downtown where they used to beg from motorists. Dedan finally agreed to go to an informal school to learn how to read and write. However, Dedan was a difficult student and often ran back to the streets. It took a lot of convincing and counseling to keep him in school even for a few weeks at a time. When Jamii Bora started as a Micro Finance institution in 1999, Dedan and his friends formed a small credit group called the Uhuru Highway Self-Help Group. They were all young beggars in the streets of Nairobi and, like Dedan, many had severe physical handicaps. Dedan tried to start several small businesses with loans of Ksh 1,000, Ksh 1,500 and then Ksh 2,000 (about US$12-25). Sadly, all his business attempts failed and Dedan kept slipping back to begging. But the Jamii Bora staff never gave up on Dedan and kept encouraging him to try again. They feared he would be one of the few Jamii Bora members who never worked themselves out of poverty. Then one day Dedan came to the Jamii Bora office on a bike! He wanted to see me and show me a prize he won in a recent small bicycle competition. We were all stunned but happy to see him so proud and even organized a little ceremony to celebrate his success. After that day Dedan came often to get help to buy bicycle spares or just to talk about his new dreams. Then a few weeks later Dedan returned with his bicycle and proposed that Jamii Bora employ him as a messenger. That would help us in Jamii Bora, he would have some income and at the same time he would spend his days biking and developing his strength and skills as a cyclist. As Dedan was already so well known and so well liked in Jamii Bora, we agreed to his surprising and innovative proposal. 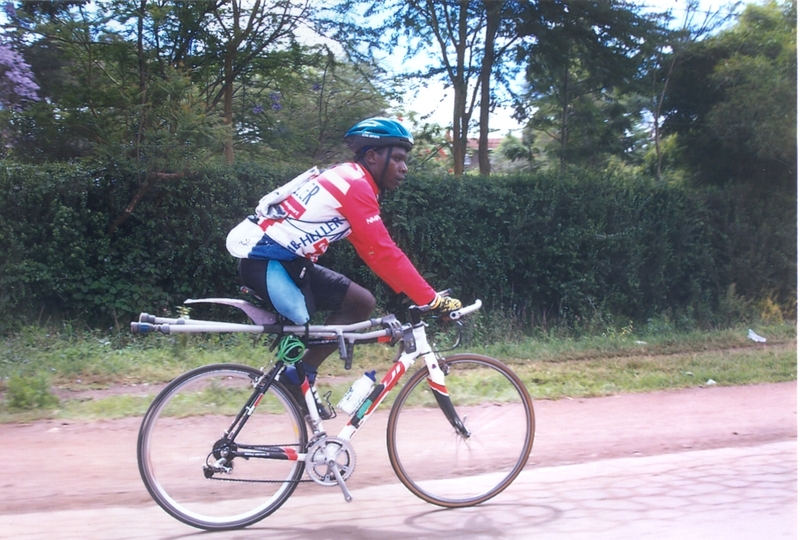 So Dedan became what is likely the only one-legged bicycle messenger in Nairobi and possibly worldwide. Dedan is now a skilled, reliable and fast messenger as well as a proud and charming member of the Jamii Bora staff. Today is another big day for Dedan and Jamii Bora. This evening Dedan is leaving Kenya to fly to Colombia to qualify for the Paralympics in China next year. Dedan and his friend Ibrahim Wafula aim to represent Kenya in this prestigious global competition. So yet another Jamii Bora member has proven that not even the sky – or having only one leg – is the limit for what our members can achieve.